Zamir kicks off its 50th anniversary season with a celebration of music, a preview of the first-ever Halleluyoh Virtual Choir, a slideshow of Zamir through the ages, choral selections, food and more! Central Reform Temple at Emmanuel Church, Boston. Museum of African American History, Boston. 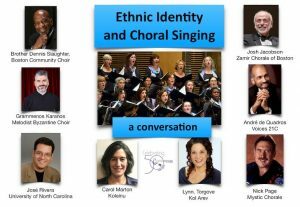 Zamir Chorale of Boston and Hebrew College’s School of Jewish Music will present an informal round-table panel discussion exploring issues related to ethnic identity and choral singing. Visitors are welcome to listen in to the conversations and will have the opportunity to ask questions and interact with the participants. Participants include Richard Barrett, Cantor at the Dormition of the Virgin Mary Greek Orthodox Church André de Quadros, Director of Voices 21C, and American Choral Directors Association (ACDA) Eastern Division Equity and Diversity Chair; Joshua Jacobson, Director of the Zamir Chorale of Boston; Fr. Romanos Karanos, Director of the Melodist Byzantine Choir; Nick Page, Director of The Mystic Chorale; José Rivera, Director of the University of North Carolina Chorus and ACDA National Ethnic and Multicultural Chair; Amy Lieberman and Lynn Torgove, Co-Directors of Kol Arev; Carol Marton, Director of Koleinu, Boston’s Jewish Community Chorus; Brother Dennis Slaughter, Director of The Boston Community Choir. In celebration of Zamir’s golden anniversary, the chorale will honor its founder and artistic director Josh Jacobson and showcase the best of Zamir’s repertoire. The premiere performances of commissioned works from composers Jeremiah Klarman, Ken Lampl, Jonathan Leshnoff, Charles Osborne, Nick Page, and Benjie Ellen Schiller will dazzle and delight. Plus you will hear some of Zamir’s all-time favorite pieces from the past 50 years performed by the 60 voices of the award-winning chorale, assisted by dozens of Zamir alumni. Be a sponsor! Click here. Add your tribute to Josh Jacobson here. Josh Jacobson to be honored.